The Island of Hawai’i, referred to locally as “the Big Island,” is nearly twice the size of all the other islands combined. Here, you can visit active volcanoes, stroll along beaches of white, black, and even green sand, and take a trip to the Kona Coffee Plantation. With so many exciting things to do on the Big Island, you’ll never want to leave! To help you sort through which activities you want to do during your trip, we’ve compiled a list of some of our favorites. Planning which things to do on the Big Island can be tough with so many options to choose from. To help make your decision easier, download our complimentary Vacation Guide. This travel planner is packed with local recommendations on attractions, restaurants, and events. Plus, find all the details about the accommodations in our chic vacation rentals. Known for its active volcanoes and unique beachscapes, the Big Island is one of the best places to explore outdoors. Hikers will love trekking to the top of Mauna Kea, the tallest mountain in Hawaii and the tallest mountain base-to-summit in the world. Lounge on the beach, play a round of golf on perfectly manicured courses, or try your hand at one of the many watersports! Here are some of our personal favorite outdoor things to do on the Big Island. Hawai’i Volcanoes National Park: A trip to the Island of Hawaii would not be complete without visiting this national park. Visitors get a look at the truly awe-inspiring Mauna Loa the world’s largest active volcano. Kilauea is a second volcano in the park, which also regularly erupts. Before going, check the park’s current volcano conditions, updated daily on the website. Pololu Valley: Begin this 3-mile round trip hike at the Pololu Valley overlook point, then follow the trailhead for a magnificent view. Overlooking the Kohala Coast, this hike is relatively easy though the trail can be slippery, so wearing good shoes is advisable. If you follow the trail down to the beach, take in the wonder of one of Hawaii’s black sand beaches. Hawaii Tropical Botanical Gardens: Though this trail is more of a loop than a hike, it’s a unique way to experience the Big Island’s wildlife. Wander through 40-acres with more than 2,000 different types of plants and vegetation in this rainforest preserve. Hapuna Beach State Park: Named one of the best beaches in the U.S. by Conde Nast Traveller, Hapuna Beach is a favorite place to lounge on the white sand. This is one of the most popular family-friendly beaches on the Big Island but can be very crowded during the busy season. Ahalanui Beach Park: A visit to this beach is one of the most unusual things to do on the Big Island! Soak in the spring-fed pool, which is heated by the nearby volcanic activity. The pool was created to capture water from both the ocean and the stream from the spring. Anaeho’omalu Beach: If you’re looking for a beach with ideal conditions for water sports like paddleboarding, snorkeling, or windsurfing, this is the place. Lounge under the shade of coconut palms or take a dip in the aquamarine waters. Known as “A-Bay,” this beach also has walking trails and two ancient fishponds nearby. Often referred to as the golf capital of Hawaii, the Big Island is a golfer’s paradise. With more than a dozen expertly groomed courses, the island has no shortage of private, semi-private, and public courses. Tee off on some of the island’s best greens like the Mauna Kea Golf Course or the two courses at Mauna Lani Resort. If you’ve never played on a bentgrass green before, head to the Big Island Country Club and try out this unique course. Tee off on some of the island’s best greens like the Mauna Kea Golf Course or the two courses at Mauna Lani Resort. If you’ve never played on a bentgrass green before, head to the Big Island Country Club and try out this unique course. Or play at the Jack Nicklaus-designed Hualalai Golf Club—home to the Mitsubishi Electric Championship since 1997. One of everyone’s favorite things to do on the Big Island is partake in the variety of watersports. Whether you’re a pro at these activities or want to give one a try for the first time, you’ll find a multitude of places offering lessons and rentals. Though visitors are usually thrilled to explore the outdoor activities on the Big Island, the culinary scene is also vibrant and exciting! Choose from a multitude of top-notch restaurants serving traditional Hawaiian cuisine as well as other global options. Here are a few of our favorite places to eat on the Big Island. Often called “the pioneer of the Hawaii Regional Cuisine Movement,” chef Peter Merriman shifted agricultural production in Hawaii, which used to import most of the country’s produce. By encouraging farmers to grow more than the standard sugar cane and pineapples, he inspired them to produce a bounty of local crops. Now, Merriman uses these fresh, local ingredients in his unique restaurant dishes. For a taste of his regional cuisine, make a reservation at Merriman. Start with the Ahi ginger poke mixed with Maui onion. Then, order the lamb from Kahuna Ranch or try the macadamia nut crusted Kona Kampachi. This restaurant describes its menu as “internally influenced, Hawaii inspired,” an excellent way to showcase both the global and local aspects of their offerings. Enjoy a view of the Kings’ Court fairway and lake from the dining room. Every night, the menu features “Roy’s Classics,” popular dishes that originated in 1988 at the first Roy’s in Honolulu. Some classics include jade pesto steamed Hawaiian fish and charbroiled beef short ribs. Diners can also choose from new options of meat, greens, fish, and Hawaiian-style mixed plates. Though the main draw of Sansei is their delicious sushi, diners who shy away from raw fish will love their other menu options. With daily and weekly specials, there’s always something new at this restaurant. Order several rolls from classic spicy tuna to the unagi eel, or share a few and opt for one of the entrees. Noodle lovers will want a taste of the shichimi-crusted filet of beef with udon noodles, while vegetarians will favor the upcountry vegetable pasta. Explore the history of Hawaii on an intriguing tour or by visiting a historical park. If you’re looking to catch a concert, take advantage of the Big Island’s theaters and venues that welcome a variety of performers. Are you looking for an unusual thing to do on the Big Island? If so, Pu’uhonua o Honaunau is the perfect place to visit! For hundreds of years, this park was known as a place of refuge (or pu’uhonua). Anyone who broke the kapu, an ancient set of laws, could avoid punishment if they were able to make it to this safe place. This area is still considered to be a sacred space, so be sure to follow the guidelines and restrictions when you visit. Walk the Royal Grounds and soak in the history and culture of old Hawaii. Hike the nearby 1871 Trail to view remains of the Ki’ilae Village. Get a taste of Broadway on the Big Island stage at The Palace Theater! Local actors and performers join together to produce their own renditions of popular Broadway musicals like The Sound of Music and Little Shop of Horrors. The theater also offers year-round concerts and musical performances by local groups and traveling musicians. Check the schedule of events to catch a seasonal show! Or, sit back and enjoy one of the monthly movie screenings. Explore the grounds of the Hulihe’e Palace and learn about its intriguing history. Originally built of lava rock, this property was home to many royal people, including Kamehameha the Great. Over time, it fell into disrepair, but the Daughters of Hawaii, an organization dedication to historic preservation, worked to restore and protect this important historic site. Film aficionados will love this movie-centric festival held each January. During the Waimea Ocean Film Festival, participants can view more than 60 movies followed by live Q&As with some of the filmmakers. With each production have a connection to ocean issues, panels, lectures, and discussions surrounding environmental topics will take place alongside the movie viewings. Each year in March, dozens of local breweries gather at the Kona Brewers Festival to serve up their unique craft beers alongside delectable Hawaiian cuisine. Attendees can sample the brews while enjoying food from talented Hawaiian chefs. Live music, hula events, a home brewers competition, and the traditional Trash Fashion Show make this event one of the best things to do on the Big Island! Indulge in this decadent festival that takes place every year in the spring. With cacao plantations throughout the islands, Hawaii produces outstanding chocolate. During this two-day event, attend seminars on cacao production, watch demonstrations and sample treats, and hear lectures by reputable speakers. This list of things to do on the Big Island is just the start! For a complete lineup of recommendations and tips, download our complimentary Vacation Guide. Ditch the outdated travel books and get suggestions from a source you can trust. Our guide will make planning your Hawaiian getaway a breeze! 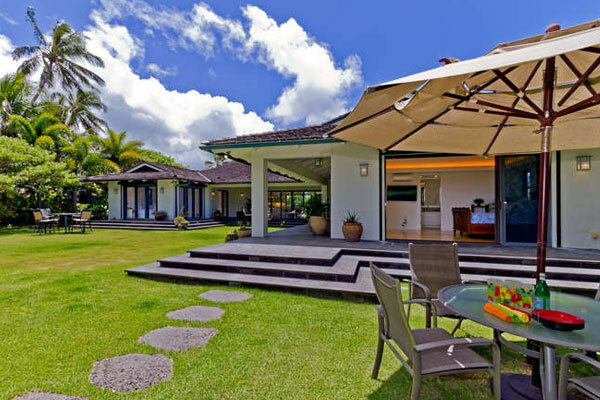 After a long day of exploring the Big Island, relax in one of our beautiful Private Homes of Hawaii vacation rentals. With easy access to local attractions and activities, our properties give you the convenience of location without sacrificing comfort. 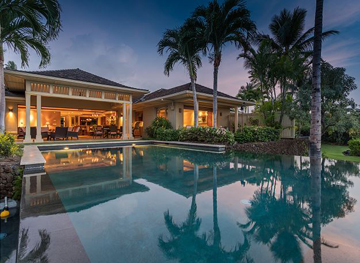 Larger groups will love the ambiance of this Honuala’i Puako residence with room for up to 12 guests. Take advantage of the gorgeous private pool, outdoor grill, and open-air dining area. Families or smaller groups can enjoy the 72-105 Pakui property, which is part of the Hualalai Resort. Relax by the private pool and spa just off the lanai and enjoy ocean and golf course views. Guests have the option to purchase passes for daily use of the Resort’s amenities such as the championship golf course, tennis courts, and more. Browse our complete catalog of diverse properties, and start planning your Big Island getaway today!